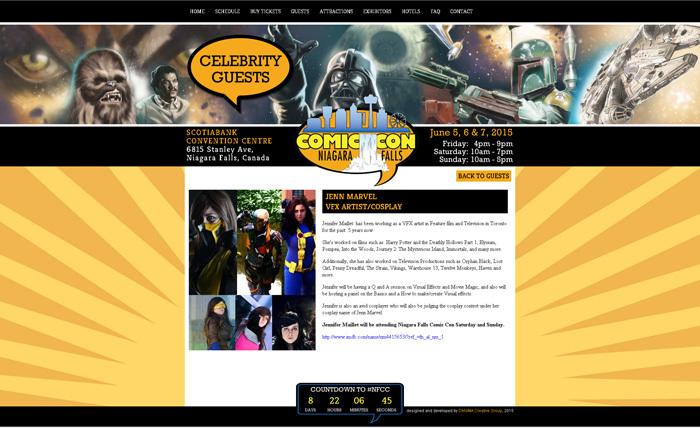 "So, this month i will be a "celebrity" guest at Niagara Falls Comic con �i will be at the con june 6-8th for all 3 days of the event. I will also be one of the judges for the costume contest.� Really looking forward to that. I am working on updating my Deathstroke cosplay as I am a mad fangirl of Manu Bennett, and that doesn't happen often. He took my love of Deathstroke to a whole other level. I am also working on a rule 63 Arrow cosplay so I can hopefully snag some photos with him. I am also working on an armored post apocalyptic Ms. Marvel. I really love making armor and I want to incorporate it more into my costumes. Other then that �June is looking like I'll be catching up on backlogged cosplays." "Hey y'all! Last month I shared with you some embroidery I was working on. I'm pleased to say that this month I can share with you the concept it was intended for. 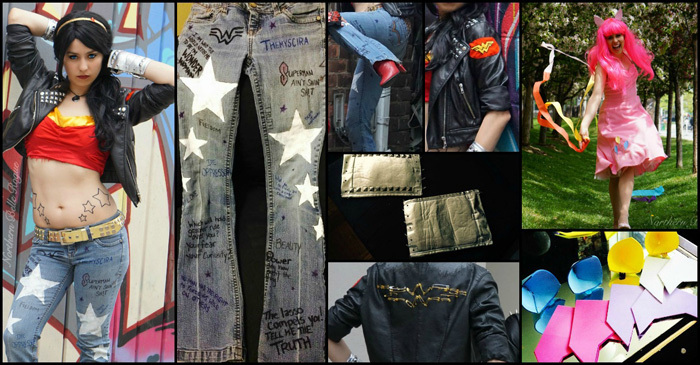 I had a lot of fun putting together this original "Punk Wonder Woman" concept. While I was working on the different pieces of it, I put My Little Pony on... intended for background noise. I didn't expect to be swept away with the world of Equestria.� I put together a closet cosplay of Pinkie in about an hour and shot that with beautiful pink blossoms. It was hard to pick just one character though and as such I'm also in the midst of working on a more "official" version of Pinkie Pie as well as a few other pony cosplays. I've definitely gone full brony and can't wait to cosplay with more pegasisters! ~GG Northern Belle Rogue"
"In the first weekend of June, Player Two will be attending Niagara Falls Comic Con along with many other Geek Girls. At this event, she plans on wearing one of her favourite costumes: Tinkerbell. 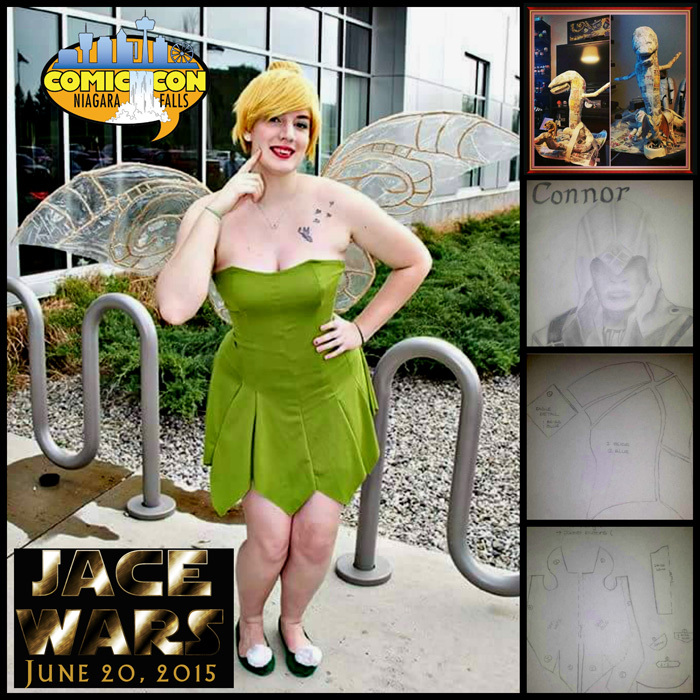 Later on in the month, on June 20, Player Two will be joined by Northern Belle Rogue to attend the third annual Jace Wars fundraiser as Disney's Tinkerbell and Belle. For more information see the promotional video she has done here. Player Two is also working on a couple of different projects including a paper mache dragon and a commissioned Connor Kenway Assassin's Creed 3 costume. You will be able to find progress photos on her instagram (@playertwogxg)"
"I started working on a Katana mask a couple of months ago and I recently picked it up to start working on it again. It is definitely moving further up my list and I would like to wear the full costume before the end of the year. Still looking around for the right bodysuit pattern and looking into making her shoulder and shin armour out of craft foam. 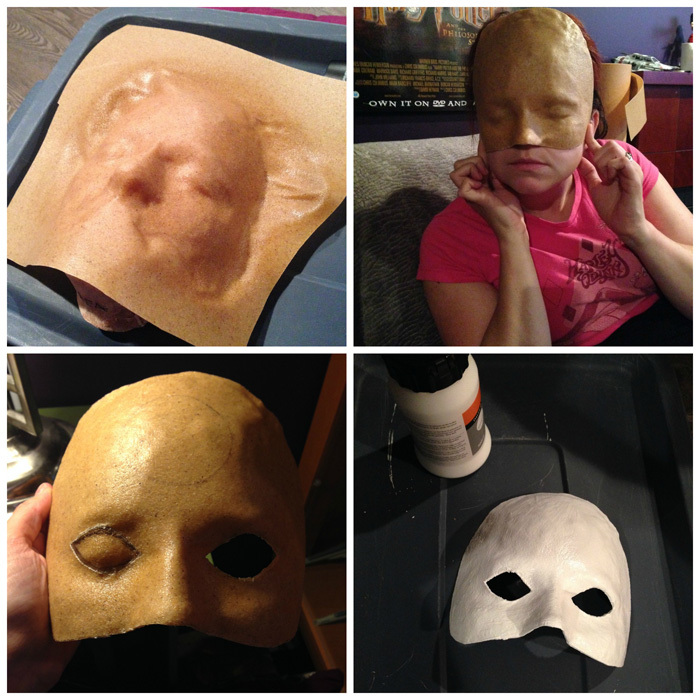 Made the mask off of a face mold of my face with two layers of worbla. Followed by several layers of gesso with sanding in between." "For the month of June, I don�t have much planned for conventions. I will be celebrating my birthday this month and am having a Game of Thrones themed birthday, which will be really fun. I�ll be wearing Evie�s Daenerys cosplay for that and she will be Sansa, as well as a few other characters. Other than my birthday, I will be doing a fundraiser with Evie, the World Partnership walk. We will go as Anna and Elsa and just interact with the children there. Should be a pretty quiet month, but July will have lots to make up for it!"